WASHINGTON — The White House has confirmed that Eric Shinseki will continue to serve as secretary of veterans affairs during President Obama’s second term. 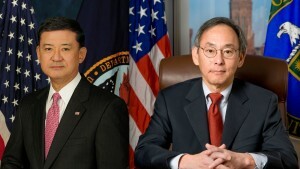 Shinseki, a retired four-star general and former Army chief of staff, has headed the Department of Veterans Affairs since the beginning of Obama’s first term in 2009. Speaking on condition of anonymity, a White House official told the Associated Press on Jan. 9 that Shinseki, Health and Human Services Secretary Kathleen Sebelius, and Attorney General Eric Holder are among the Cabinet members who are staying. Also expected to continue are Homeland Security Secretary Janet Napolitano, Agriculture Secretary Tom Vilsack, and Education Secretary Arne Duncan. Chu has been criticized for a $500 million federal loan to Solyndra, a solar-panel manufacturer in Fremont, Calif., that went out of business just two years later. Definitely leaving are Secretary of State Hillary Clinton, Treasury Secretary Timothy Geithner, Defense Secretary Leon Panetta, Labor Secretary Hilda Solis, Interior Secretary Ken Salazar, and EPA Administrator Lisa Jackson. Commerce Secretary John Bryson has already left for health reasons. Obama has faced some criticism from his own party over lack of diversity in his next Cabinet, as his nominees so far — Sen. John Kerry for secretary of state, White House Chief of Staff Jack Lew for treasury secretary, and former Sen. Chuck Hagel for defense secretary — are white males. With Shinseki, Chu, and former Washington Gov. Gary Locke as secretary of commerce, Obama’s Cabinet had three American American members, an all-time high, until Locke was appointed U.S. ambassador to China. President George W. Bush had Norman Mineta as transportation secretary and former United Way CEO Elaine Chao as labor secretary. To date, Chao is the only Asian American woman to have served in the Cabinet. Mineta, previously a congressman, became the first Asian American in the Cabinet when he was named commerce secretary by President Bill Clinton.